MagicRed Casino welcomes players to a realm of marvel, where they can experience the true magic of the finest casino games. An amazing selection of slots, table games and video pokers is just one click or tap away, for those who play on mobile. Irresistible bonuses for new players and ongoing promotions for existing members keep everyone happy and hungry for more. Join the fun adventure at MagicRed Casino today! MagicRed Casino is a regulated gambling operator, licensed by the Malta Gaming Authority. The games on their websites are powered by Aspire Global International which is also licensed by the MGA. Those who play in the United Kingdom will also find solace in the fact that the casino is licensed by the UK GC. There are several ways of enjoying the nice variety of games available at online casino MagicRed. The most straightforward, therefore popular solution is to do it straight in the browser without downloading anything. This is a system used by the vast majority of those who have an account here. Players are provided with the alternative of downloading games and the casino has a dedicated app. This means that players enjoy enhanced convenience on smartphones and tablets powered by various operating systems. 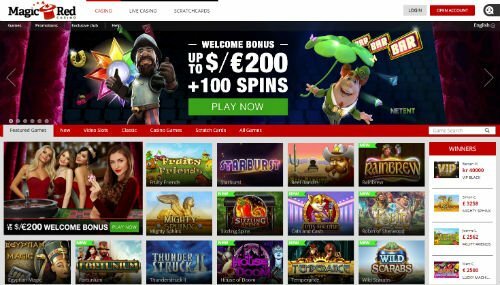 MagicRed slots are the dominant genre on their website, but the collection is still small compared to what other casinos offer. That’s the result of them choosing to provide players with original and innovative games, rather than overwhelm them with content. Foxin' Wins, Merlin's Millions, Gonzo's Quest and Jack and the Beanstalk are some of the classic games that can be enjoyed here. Produced by leading developers such as NextGen and NetEnt, these games have a high return to player and some of the finest graphics. New games are being released all the time and often players who embrace them first receive MagicRed Casino free spins. The bonus rounds can be used on mobile devices and are easy to convert into cashable funds. Occasionally, the casino will even offer similar incentives to those who would rather stick to retro slots like Fruit Shop, House, Dress Up Diva, Pirate's Paradise, Twin Spin and Stickers. At the opposite end of the spectrum are MagicRed Casino jackpot slots whose prizes are pooled with other casinos. A gambling operator depriving players on the thrills of live dealer games will stand no chance in today’s competitive environment. MagicRed Casino roulette, blackjack and baccarat can be played against real croupiers. All these games are broadcasted in real-time from professional studios, so players enjoy the ultimate home gaming experience. The collection of games is completed by arcade games and scratch cards, such as Fast Hands, Memory Madness, Road Racing the Bubble Bingo. 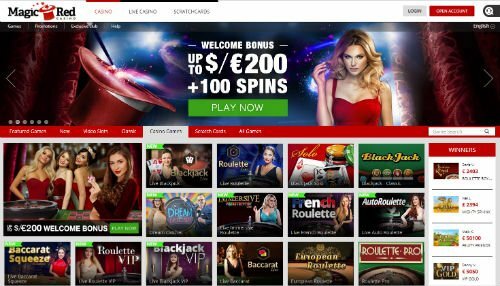 New gambling operators have a hard time attracting new clients, but this is not the case with MagicRed Casino. Before players get to appreciate the quality and diversity of their games, they enjoy the generosity of the MagicRed welcome bonus. Players who open an account will have the first deposit doubled up to €200 or currency equivalent. The casino will also throw 20 free spins into the mix and many more are available when players reload their account. To claim the MagicRed Casino bonus for new players, one would have to make a deposit of at least €20. Before a cash out is permitted, players are expected to bet the bonus and deposit through 35 times. There are plenty of qualifying games and mobile compatibility is insured, which only makes the bonuses more exciting. MagicRed Casino has built a reputation for paying out bonuses in full. New players can sign up for the iPhone X challenge and compete for a chance of winning the flagship smartphone. This is a shining example of a recurrent promotion, which is also targeted at specific slots, in this case Gnome Wood and Dragonz. Some campaigns award random bonuses, while others, such as this one will reward perseverance and commitment. There are consolation prizes for those who move up the leader board, but miss out on winning the smart phone. 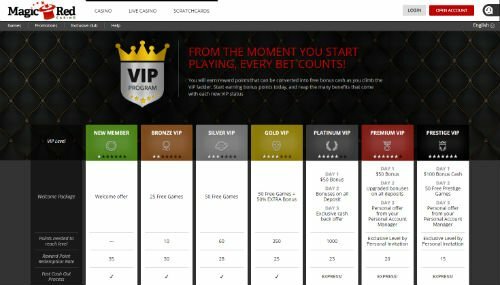 The VIP program is fully fledged and has several levels, with the highest ones reachable by invitation. As players move up the loyalty program, they unlock progressively bigger rewards and special prizes. The Magic Red casino VIP program includes monthly cash back deals, free spins, birthday presents and the assistance of a dedicated account manager among others. VIP players can also participate in exclusive campaigns, such as the Last Survivors with guaranteed prize pools. Players who choose to gamble on real currency can deposit and wager in GBP, Euros, USD, Australian dollars, Canadian dollars and Scandinavian currencies. Deposits are performed instantly and cash outs are decently fast, with reasonable monthly limits. The list of accepted MagicRed Casino payment methods includes Paysafecard, iDeal, EntroPay, Skrill, GiroPay, Poli, wire transfers and Visa and MasterCard. Customer support is available seven days a week via live chat but only between 8 AM and 1 AM CET. Outside business hours players have to write an email and wait for a response the next day. The casino works with NetEnt who provides most of the games, but also NYX Interactive and Play’n Go. Those who land on the website and want to play original games won’t be disappointed. That’s because some of the games are provided by Aspire’s proprietary software, so they can’t be found anywhere else. These games are mobile friendly and players can download the MagicRed Casino app to enjoy the best experience on Android and iOS powered devices. The sensitive information of players is protected using SSL encryption technology. Meanwhile, the fairness of the games is guaranteed by independent auditors who regularly check the house edge and the random number generator. Players who fear the risk of gambling addiction are provided with assistance and directed to specialized organizations, capable of helping them. The MagicRed Casino sign up process consists of three steps, which can be completed in a quick succession. Basic information is requested from players, such as the full name and address, country of residence, gender and a valid email address. This is all important information that should be entered correctly, so players can verify their account. This procedure is conducted over email, but the casino reserves the right to ask for proof of identity and residence later on. The conclusion of this MagicRed Casino review is that players risk nothing if they sign up. Those who join will be able to enjoy all the MagicRed Casino games on real and virtual currency on desktops and mobile. Payment methods are fast and reliable and the casino enforces the best industry practices, to keep players safe and happy. The only downside is that customer support is not available 24 hours a day. - MagicRed Casino has a beautiful website, intuitive and easy to navigate. - They offer an eclectic mix of proprietary software and games from leading developers. - The mobile takes convenience of gambling on smartphones and tablets the next level. - Customer support is not available 24/7. Get your fortune playing Lucky Louis casino games!